She's short, scared and doesn't know exactly what to do in this new world. Freshly turned into a zombie, Abby has quite a lot to discover about herself. She loves Benedict and trusts Petunia blindly. In fact, most decisions she makes are pretty on the spot. She would like to be human again, which is no small task. 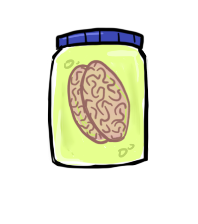 He's a talking brain in a jar. Benedict has a deep, beautiful British voice and a very dry wit. He may not have limbs, but he's very useful to Abby. Especially for throwing. She's sweet, sensitive and a little spacey. 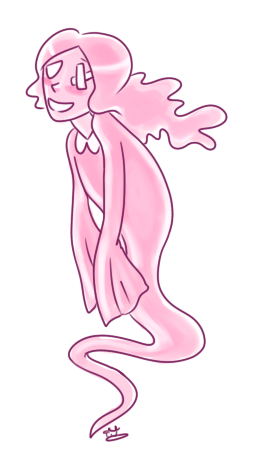 The friendliest ghost in town! Not as freshly dead as Abby, Petunia does know a few things about this new world. She also really likes to swim. There's still a lot she has to learn. He's a vampire that's addicted to nicotine, but uses it to his advantage. He has the ability to create smoke animals, wings, shields, all sorts of things! Is allergic to sunlight, but the smoke protects him. Like most vampires, he prefers solitude. Definitely has a soft side, though.. The most mysterious character..he is literally a sentient shadow. But what he lacks in actual body, he makes up for in personality. He loves to make jokes and poke fun at everyone. But really, who can trust those yellow, lifeless eyes?